SAP is the world's largest business software company, employing over 38,000 people in more than fifty countries. Already a world leader in ERP systems, SAP's Enterprise Portal platform is strategically significant, as it is more than just a portal; it is the integration point for SAP's various ERP software, enabling end-users to access content and systems in a unified, user-centered environment. When SAP released Enterprise Portal 6 (EP6), now NetWeaver Portal, CEO Henning Kagermann wanted the company to have a firstclass implementation on its own corporate portal. Besides the internal productivity gains, the power of such a strategy was clear: SAP's intranet would be a model case study for the very platform it sells. The goal of SAP's new portal was to create a central access point where all employees could do their work, thereby consolidating an existing collection of sites and sub-portals. HFI was engaged to perform a benchmarking study and design review to help guide the Enterprise Portal implementation. HFI conducted stakeholder interviews and data gathering across multiple sales and product groups to understand their needs and prioritize problems. For example, one team felt the "discussion board" tool was most important to their users, while others cited search functionality or a specific balance of global vs. regional content. 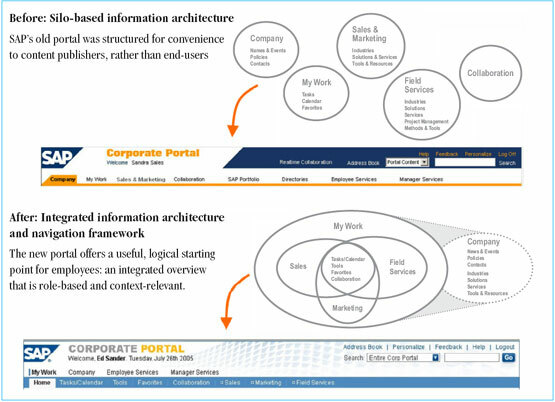 However, the fundamental issue with the old portal was that content and functionality were disjoint. The design suited content publishers more than it helped end-users accomplish their tasks efficiently. HFI advocated a phased approach for SAP to roll-out the changes to its portal. Short-term recommendations could be implemented more quickly and then validated through further data gathering and user testing. This would provide an informed basis to incorporate long-term improvements. In addition, the Internet has mandated a shift towards "self-service." Employees expect to find information and complete transactions on their own, and portals are the glue that hold effective self-serve systems together. SAP's new portal met all of these criteria. It was readily adopted by employees because it delivered on the promise of user convenience, and the company benefited from improved efficiency and collaboration. SAP has proven that it stands behind its own platforms, and its successful portal rollout offers a roadmap for all companies to follow.